Olympic gold medallist Penny Oleksiak is mourning the loss of her former schoolmate who was killed in Sunday's deadly shooting on Toronto's Danforth Avenue. Reese Fallon, 18, was one of two people killed when a gunman went on a shooting spree on the busy East Toronto thoroughfare. A 10-year-old girl was also killed. Thirteen others were wounded. The 18-year-old Oleksiak, who won gold and three other medals at the 2016 Olympics in Rio de Janeiro, grew up in East Toronto and on Monday posted her condolences on Twitter. My heart is hurting after hearing about the Danforth shooting. My prayers go out to everyone affected, especially Reese’s family, I went to school with her and she was amazing and so sweet❤️ stay strong. Other athletes in the city were also shaken by the violence. John Axford remembers going to bars and concerts around Toronto's Greektown neighbourhood years before he became a Blue Jay. When the right-handed reliever from Port Dover, Ont., saw a photo of the area Monday afternoon — closed off by yellow police tape after a deadly mass shooting a night earlier — he shook his head. "Devastating. It's hard to put into words," Axford said before Toronto opened a three-game home series against the Minnesota Twins. "This summer seems to be unimaginable thus far with tragedies that have occurred here. "I know we're not immune to certain things like this in Canada but it definitely seems out of the ordinary and it's sad to see these things continue to pop up." The shooting is the second mass casualty incident of the year in Toronto after a van attack killed 10 pedestrians on a busy stretch of Yonge Street north of the city in April. The Blue Jays held a moment of silence before Monday night's game while the words "The Danforth .TorontoStrong" appeared on the scoreboard in centrefield. The team also observed a moment of silence for victims of the Yonge Street attack the day after it happened in April and months later honoured Const. Ken Lam, the officer who arrested the van rampage suspect, before their Canada Day game at Rogers Centre. "Guys who have been here for a while love this city and they'll rally around anything that happens here, whether it's good or bad, but especially when it's something tragic," Axford said. "We saw that earlier with the Yonge Street attack in April. "This team has been really good with being able to come together around a tragedy. I think as a team, we embrace that because everyone that has played here loves the city and loves the people and feels close to the situation." Catcher Russell Martin, who was born in Toronto's East York neighbourhood, near where the shooting happened, said he hoped the Blue Jays could help rally the city in the aftermath. "As humans, as a species, I think when things go bad people tend to rally together," Martin said. "You wish it would never happen, but as far as being on the stage that we're on, I think it does give us an opportunity to help rally people together. That's why we do it." Toronto FC coach Greg Vanney, an American who has been with the MLS club since December 2013, said it was surprising to hear about the shooting. "You see this stuff going on unfortunately in the U.S. and a lot of cities and you felt like 'well Canada and Toronto have been immune to some of that stuff.' That's always been, from my perspective, something that I've really appreciated about Toronto and Canada in general," Vanney said. "Somehow we up there weren't getting drawn into the crazy stuff that was going on down there. And to have the situation that happened on Yonge Street and now this." TFC midfielder Jonathan Osorio, a native of Brampton, Ont., said it was "heart-breaking to see all this stuff happening in the city." "Especially a city that's known for its peace and its good people and lack of gun violence," Osorio continued. "I really don't know the possible reason as to why it's all happening, but it's the reality right now. I really hope the police and the people of Toronto can do everything they can to change that situation and make Toronto the way it was before." Police Chief Mark Saunders did not speculate on the motive for Sunday night's rampage, which also injured 13 people between the ages of 10 and 59. 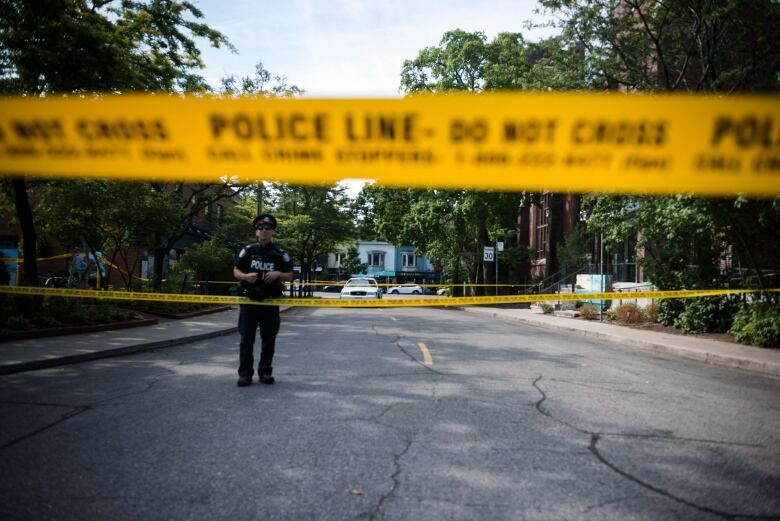 Authorities said the suspected gunman, identified by Ontario's Special Investigations Unit as 29-year-old Faisal Hussain of Toronto, fled the area on foot and was later found dead with a gunshot wound. Toronto Maple Leafs forward Mitch Marner, a 21-year-old from nearby Markham, Ont., was one of the many athletes to express their condolences to victims over Twitter Monday, saying he was "shocked and saddened" to hear the news. Newly acquired Maple Leaf and Mississauga, Ont., native John Tavares, who signed a big free-agent deal with his hometown team on July 1, tweeted a black and white photo of the city skyline with the hashtag #TorontoStrong. Blue Jays right-hander Marcus Stroman also shared his sentiments on Twitter. "Prayers for everyone involved with the shooting in Toronto last night," read a Monday morning tweet from the 27-year-old who grew up in Medford, N.Y. "This gun violence needs to stop man. We need more life, not less!"